Summary : This flavored black tea does a nice job of combining chocolate and cinnamon flavors into a very enjoyable tasting package. If you like cinnamon and/or chocolate teas, you'll like enjoy this tea. 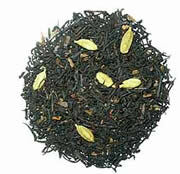 Review : When I purchase tea, I generally go strictly by the name of the tea. I mean, who wants to dig around and look at all the mythical ingredients that go into it. Or worse yet, hop online and do research about every little thing that you know nothing about that goes into this tea. Because of this peculiar trait of mine, along with my deep love of chocolate, I ended up with a Black Cinnamon Cocoa tea that is available through the Dragonwater Tea Company (now out of business). I just couldn't pass this tea up. I mean...could you? Chocolate + Cinnamon should equal one very fine tea. And if not, since it is after all a chocolate tea, it should at a minimum be "passable." In short, I feel safe when buying chocolate teas that it at least won't end up as drain cleaner in my one-star tea categories here on this site. Here is how Dragonwater Tea Company (now out of business) describes this tea on their website : "Black Cinnamon Cocoa Tea. Black tea with cocoa, cardamom pods, and cinnamon. " This tea has a wonderful aroma right out of the package. OK. It's isn't perhaps as powerful as I would have liked, and in particular I thought the aroma of cocoa (chocolate) was on the weak side. Still, you can't ever fully judge a tea by its smell, so off I went to brew what would turn out to be a very enjoyable flavored black tea. Once brewed, this tea has your rather typical black tea "copper" color to it. Yet, in no way shape or form does this tea taste like a "traditional black tea." And for me...that is a relief...as the taste of pure traditional black tea is enough to make me choke without a healthy does of additives such as milk, cream, honey, sugar any anything else that looks intriguing at the moment. That said, I was a bit surprised at how relatively subdued the cocoa flavor was in this tea. I guess I was expecting more "chocolate" flavor in this tea. After all, this tea contains actual cocoa beans, and big ones at that! Additionally, the cinnamon flavor was also hardly overpowering. Indeed, I would describe the cinnamon flavor in this tea as moderately weak. Yet, in the end, the mixing of cinnamon and cocoa is pulled off smoothly. While this tea did not have that full "chocolate flavor" I was hoping for, it still had more than enough to satisfy my taste buds at midnight, so I can't complain. And the cinnamon flavor, while very weak, still did seem to add "something" to this tea...I just haven't figured out yet what that is! Recommendation : Yes. This tea has a very enjoyable flavor to it, and while not as strong in the chocolate department as I would have preferred, this tea is still quite tasty and flavorful. It creates a unique taste though the mixture of black tea, cocoa and cinnamon. This means if you like chocolate, in any shape or form, the odds are very high indeed that you will enjoy this tea to some degree or another. Brewing Instructions : Pour 1 cup boiling water over tea leaves. Let brew for 3 minutes.